After reading a few more renditions than I expected of these wonderful books, I decided to publish a baby Shakespeare book. I also noticed some small discrepancies. Dinner will be this gigantic Napoleon, a glass of milk that will cover your entire floor, and a bowl of gruel. 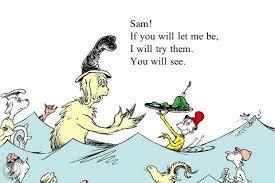 Where the Wild Things Are: It’s nice Max finally gets his supper, his mom seems pretty cool. But is that a responsible amount of cake to leave alone with a kid who nails things to the wall and can stare down a horde of monsters? That’s like a pound and a half of cake. He’s going to be up all night and there will be frosting in the electrical outlets for YEARS. If he needs to get up in the night to tend the fire, Little Bunny dons the fuzzy slippers and tiger skin to keep him warm. Goodnight Moon: It was a Different Time. Everybody was doing green and red nurseries with tiger-skin rugs. Rabbits kept misshapen cats as pets. You had to have an uncovered fire burning all night or the piskies would steal your little bunny, prison pajamas and all. A balanced meal contains two kinds of sausage and at least five desserts. The Very Hungry Caterpillar: The only vegetable in this book is a pickle. Sheep in a Jeep: Deceptive sales practices!!! Dear Zoo: Who does this kid know? Are these letters coming from the White House? The business end of a space laser? If I write the zoo, can I get a snake? Because that is a pretty neat snake and the basket will go great in the living room. Had a lovely time, thank your mother, we'll see you Wednesday. Fox in Socks: When beetles battle beetles in a puddle paddle battle, and the reader who is reading is a toddler who can waddle, the meaning of the ending when the fox is in the bottle is real easy to be reading as a sibling sitting session. Kids, don’t try this at home. Guess How Much I Love You? : Big nut-brown hare really has a lot to prove. You have to get the last word in on a little nut-brown hare, buddy? You can’t let the kid win? Green Eggs and Ham: Perhaps we should respect our top-hatted friend’s decisions about what he wants to eat, and not pester him into trying this clearly questionable meal. Maybe he has dietary restrictions. Maybe he knows the health inspector. Why are they in the water? How did his hat get so smushed? Is that fear in Sam’s eyes? Is this a prelude to a scene from The Godfather? The Very Busy Spider: This just is “How to Talk to a Woman in Headphones” with animal noises.